I've been experimenting with a few new natural hair products and I wanted to share them with you guys and let you know how my experience has been! So far I've been fortunate enough to find that most of the products that work for my hair are actually pretty cheap! 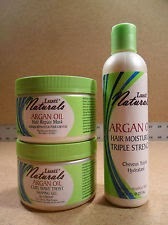 My first experiment was with most of the products from the Lusti Naturals Argan Oil line. Lusti Naturals Argan Oil 4 in 1 Leave-in Conditioner - This stuff has been really great for my hair! It's not too thick but not too watery either, smells good, and really does make your hair feel moisturized! I use this product more at night to condition my hair (I do the LCO method), and it makes my hair feel lovely! Lusti Naturals Argan Oil Hair Repair Mask - Now for me, this product this good, but not necessarily for it's purpose. The jar says that it "restores elasticity and strength caused by chemical processing," hinting that it may be good for people who are transitioning from relaxed to natural; so maybe that's why it didn't really do much for me, because I haven't had a perm since middle school. When I tried it, it seemed to feel like it stripped my hair a bit and really brought out my texture, but it didn't really feel conditioned like I've felt with other products. However, the next time I washed my hair I tried it as a pre-poo. I mixed the hair mask with coconut oil, put it in my hair, let it sit overnight, and washed it out in the morning. I found that my hair felt soft and conditioned after it was all said and done. As a result, I think I will keep this as a pre-poo instead of a regular deep conditioner. Lusti Naturals Argan Oil Curl Wave Twist Shaping Gel - This product didn't really work for me, but it did work for my sister. The instructions tell you to apply a small amount to the hair, but my hair is thick and coarse meaning that a small amount doesn't necessarily hold my hair down. So if your hair is thinner or works easily with gels then this product is probably for you. However, I had to put a good bit on my hair and I had some flaking and I didn't really like how it made my hair feel. However my sister and my mom, who both have locks, tried it. My mother, who's hair texture is similar to mine, didn't really like it, but my sister, who has more of a 3b-4a texture, actually liked it. All three of these products are available at Dollar Tree, on Amazon, and even on Ebay. Have you tried any of these products? How was your experience? Comment below and let me know!